We may call this a philosophy of Competitionism – people need names that encode thinking, so this name might serve as well to fill the need in this case. We could also use other names, such as Scientific Pragmatism, Philosophy of Infinite Variances, or why not Interpretationism, and even Expressionism (for we are really dealing with subjective feelings that are raised to the level of explanation of the objective observations). – Competitionism, although not a beautiful word, points most adequately on the very forming feature of the ideas I present; ‘competition’ more than anything is the decisive new insight to philosophy (something we have naturally known all the time, while rejected from the beau monde of philosophy and la science pour la science). The notion competition is like the long lost missing key that fits into the lock of scientific mysteries; we now turn the key and open the valve and we are faced with the truth: a whirlpool of feelings. We automatically police feelings by taking them into the ‘mind’ in form of more or less orderly perceptions of things and thinking; the perceptions are constantly affected and arranged by an endless social competition on each level of life (this human life cannot be but social life). Competition is what causes the idea of stability and yet it is also what brings the change. Each human act (even the infinitesimal) is an act of competition. We are dealing with perceptions in competition; the perceptions stem from feelings, and to the external they come in form of expressions. Expressions are a result of interpretations of feelings, but we cannot separate expressions and interpretations into two, they are essentially aspects of the same, and have to be seen as the one forming the other. A human being is constantly engaged in interpretation; through the senses we interpret the outside world; the body in manifold processes constantly interpret what is going on in the organism (the homeostatic regulation system; hereby we can see that there is no such sharp distinction between a man’s external and internal world). – Most of the interpreting goes on unconsciously (we cannot draw a line between conscious and unconscious interpreting). – In social connection we interpret the language (language in broad sense), but most importantly we interpret with the language. I hope it is clear that there is not ‘a single atom’ which is not the object of our interpretations – all that we perceive with the senses becomes the object of interpreting. – The essence of interpretation is substituting one expression with another. And now it becomes evident that this interpretation must be the truth. - The truth is that all what we deal with are interpretations; there is never anything more fundamental to be found – in anything. – Now, we have unfolded the riddle of truth. – I can sense a deep disappointment among all the absolutists. They all wanted to privatize the truth – but now, how can one privatize an interpretation! Notwithstanding some feeble attempts, the distinction between natural sciences and social sciences has never been properly made. The ideas expressed in this book are the result of coming to the insight that a radical and sharp demarcation between these types of sciences will have to be made. This is because the objects of study in these are totally different. Social sciences do not deal with things; words are not things. 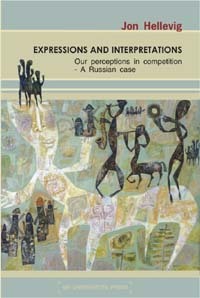 - This book introduces a new distinction with ‘things’ on the one hand, and ‘expressions and interpretations’ on the other hand. Language and social practices (among them philosophy and science, which are but aspects of the same) have up till now been conceived based on an analogy to things and their movements (both by a conscious effort, and just as an evident background assumption). Expressions and Interpretations expels all vestiges of the thingly worldview from philosophy and social sciences, and instead it is shown how language and social practices stem from feelings. Language is the expression of our interpretations of feelings – with this we see that there is no certainty, no philosophical and scientific truths nor facts – when all we start with is an interpretation, then we, naturally, cannot move further than to the next interpretation. We are constantly interpreting language; sometimes interpretation is done as a concentrated effort, but most of all we just interpret by being – being consists of interpreting. – But, the fundamental philosophical question should not be about interpreting language, but the feelings that are behind language. Language as such is the tool for expressing interpretations (and fundamentally not the object of interpretations). With the demolishing of the ‘mental thing’, and the thingly philosophy (and the thingly social sciences) enter perceptions and competition. 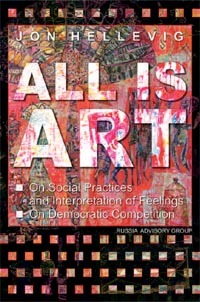 It is shown that social life is about expressions and interpretations, of perceptions, in constant competition. The organizing idea of competition familiar to us from economics (especially from the correct understanding of [market] economy as Adam Smith taught us) becomes the new paradigm of philosophy and all social sciences. 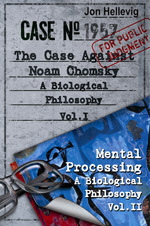 This book is born out of a frustration with the degeneration of liberal values in modern day Europe (as it turned out America seems to compete with Europe in the normative hysteria that has become a threat to life), and a need to voice a total rejection of all collectivist explanations of mind, anchoring all reality in the individual human being.